If you’re just starting out in your career, you’ve chosen a particularly good time. And while you probably don’t have extensive work experience, you still have a lot to offer a prospective employer. Everyone has a career story to tell. Whether it can fit on one resume page or several, the key is showing how your unique skills and abilities contribute to the success of the hiring organization. Don’t think that having just a one-page resume is a bad thing at all. Even for experienced jobseekers whose resumes are several pages long, the first page is usually the only one that gets seriously looked at. That’s one of the reasons resume experts advise putting the most important content on the first page. But in your case, you may be worried about having enough to fill up even one page. Rest assured, you probably do have enough. Yet the idea is not to embellish it with everything that you think might look good, just because you think any white space makes you look like a tyro. The idea is to craft a one-page document where everything counts, and is relevant to the role you want to apply for. 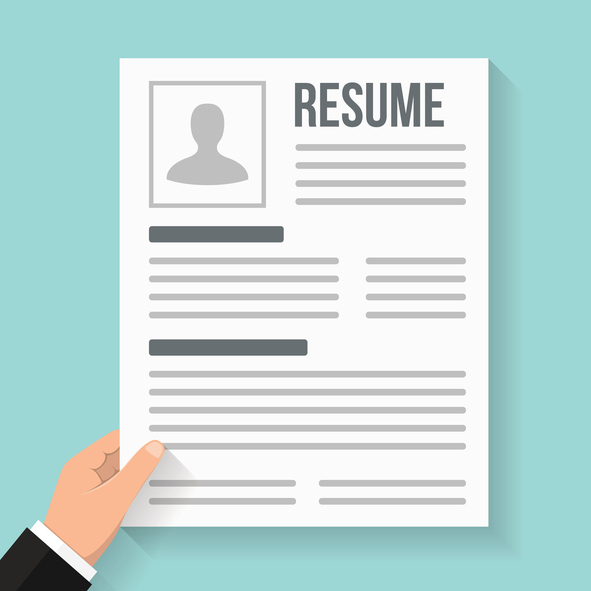 Jobseekers with several years of work experience typically use a chronological resume, where the focus is on employment history, positions held, and length of time in each position. Even though it is the most common resume format (and the one you are likely most familiar with), you will probably want to avoid using it. The reason is that it highlights your lack of experience, rather than the skills you have already accumulated. Instead, you will likely want to use a functional resume format, also called a skills-based resume. On a functional resume, your skills, accomplishments, and relevant experiences come to the forefront, while work history is placed in the background. Typically, a functional resume begins by highlighting and prioritizing your skills, and ends by listing your work history (but only job titles and employers). Take a few moments to familiarize yourself with the functional resume format. It will help you with the next step, where much of the heavy lifting gets done. That’s the name of the game with any resume, whether entry level with little work experience, or senior level with decades of seasoning. For new workforce entrants like yourself, the advice is unanimous: begin by creating a list of all your skills, accomplishments, achievements, talents, relevant experiences, and anything else that is transferable to the roles you are seeking. That may include school, work, extracurriculars, internships, co-ops, and volunteering. Many employers regard volunteer work very highly, so give extra thought about how your volunteer experiences might map to what an employer needs. Anything you accomplished that is quantifiable should also be included in your list. Don’t neglect the soft skills that employers especially value: communication skills, customer service, and problem solving. Anything that bespeaks a good attitude, team player, strong work ethic, tenacity, conscientiousness, or being a quick learner is also highly worthwhile. This is no trivial task, but it will be well worth it. You might use only parts of your list for the actual resume. Yet the idea here is to build a database of what you’ve done that is relevant to what you aspire to do in the near future. You’ve done the hardest part. Now comes the funnest: selecting a visual design that showcases your unique background. After you have a working list, check out some of the visual designs that functional resumes often take, and start by working from a resume template. It’s the easiest way to get started, and you can always tweak the elements later. As you start populating the fields, pay special attention to how you are grouping your skills and accomplishments. Try out different combinations, and ask for feedback from family members or trusted peers. Don’t be afraid of leaving a little white space. What matters is that everything you include in your resume belongs there, both text and visuals. This is the age of digital business. Your resume is a datasheet, not a brag sheet. And while there’s nothing wrong with marketing yourself to be as competitive as possible, it is never acceptable to lie on your resume, or stretch the truth beyond the bounds of believability. Everything appearing on your resume must speak to you being right for the job, and be relevant for the job you are applying for. Everything must also be verifiable. There are no gradations in resume dishonesty. A lie is a lie no matter how earnest the intent, and always carries unfavorable consequences. But if you’re the sort of jobseeker who takes the time to learn how to create an effective one-page resume, you’re way better than that. You’ve got no need to tell tall tales when you can make your resume shine with your career story. Author: Instantly create a resume that employers will love with Resume-Now. Whether you’re applying for your first job, changing careers, or returning to work, Resume-Now gives you the tools to help you find a career you will love, including templates, formatting tools, a collection of resume samples for every industry, and a resume builder.